1,000 Burmese Monks Protest Junta Abuse-- Get Beatdown! 1,000 brave Buddhist Monks marched into Yangon, the capital of Myanmar, today protesting the brutal harassment by the ruling military junta. 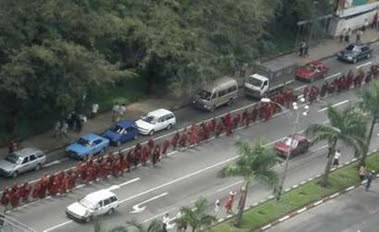 About 1000 monks are staging a protest march against government harassment in Rangoon, according to eyewitnesses in the former capital. Bystanders have told DVB that the monks tried to march on the famous Shwedagon pagoda at about midday today before being stopped by pagoda officials and government workers. The monks then changed direction and headed for Sule Pagoda down town. “The monks are currently at the junction between Anawratha and Sule Pagoda road. There are about 20,000 people standing around watching them,” one eyewitness told DVB on condition of anonymity. “The Swan Arr Shin and government officials are there too. But they are not taking any action against the monks because they are outnumbered by the bystanders,” the eyewitness said. The monks said that if the government refused to appologise, they would stage nationwide protests starting this week. So far there is no indication that the government plans to back down over the incident. The protesting monks dispersed quickly after the junta fired teargas on the monks and beat them down with sticks. The junta was not interested in their demands.